Increase the visibility of your products and benefit from the major publishing partnerships that TraceParts has concluded with CAD & PLM Vendors and Online Media. TraceParts develops content syndication solutions for every kind of project according to specific needs. Amp up your order book by viewing and instantly configuring your products in 3D! Give your customers an instant response to their specific needs for selecting and configuring your products. 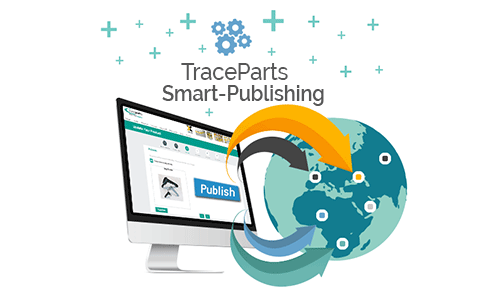 Maximize your productivity and publish up-to-date models more easily and faster by using TraceParts Self-Publishing platform. Need a native app for mobile devices? TraceParts provides component suppliers with a dedicated mobile application to promote their products in 3D on iOS and Android tablets & smartphones. TraceParts allows parts suppliers to add a Request For Quotation option to their product catalogs published on the CAD content platform.